Surinam Airways Cargo uses an Airbus 340-300 on the Mid-Atlantic route. The ULD's used on this aircraft are AKE – containers and PAG or PMC pallets. The cargo capacity for this aircraft is approximately 11550 kg / 25410 lbs. 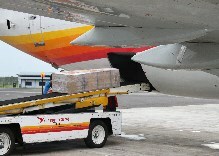 On the Boeing 767-200 freighter from and to Miami, we use PAG and PQA pallets. This freighter has an actual cargo capacity of up to 40.000 kg / 88000 lbs. On the regional routes Surinam Airways operates with three Boeing 737-300's were the cargo is all bulk-load so there is no use of ULDs. The cargo capacity for this aircraft is approximately 900 kg / 1980 lbs.